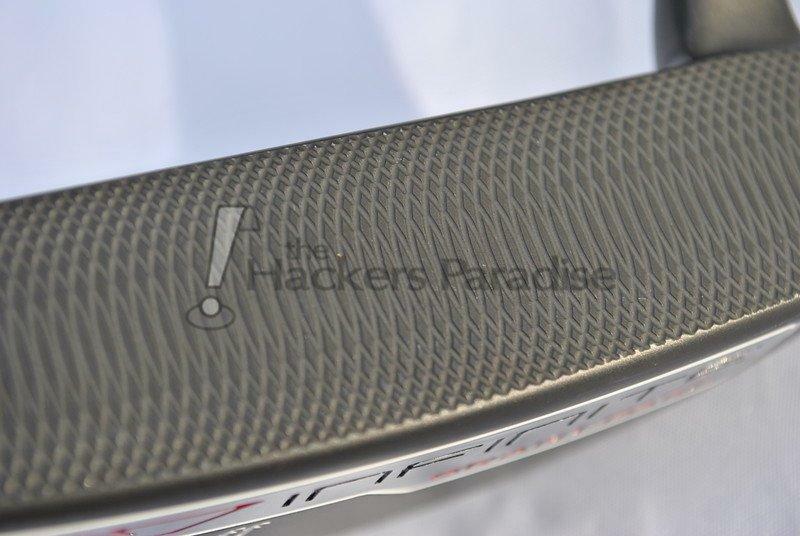 The putter market can be a very fickle one. It takes a multitude of things to really establish a presence and get people to take notice. Although Wilson Staff has not stopped producing putters, this year marks a truly focused effort to reclaim attention in the jungle-like putter section of the golf industry. With the Infinite line of putters, W/S has a lot working for them right out of the gates. The name Wilson Staff and all that it entails in golf history, embracing a plethora of traditional putter shapes, jumping all in on the ever-growing trend of counter-balanced putters, and a price point of $99.99 that means instant accessibility for golfers of all incomes, but most importantly they have a story. THP was able to spend some time with the Infinite line of putters and get a better understanding of what Wilson Staff is looking to accomplish with this release. 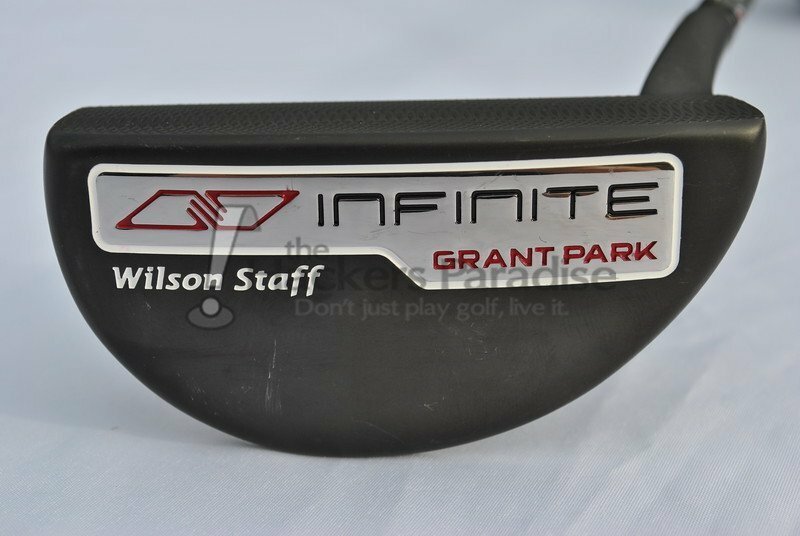 The Wilson Staff Infinite putter line includes six classic head shapes with refined detailing, each featuring counterbalanced technology for a more controlled putting stroke. Inspired by the company’s home base in Chicago, each putter is named after a local landmark or neighborhood. 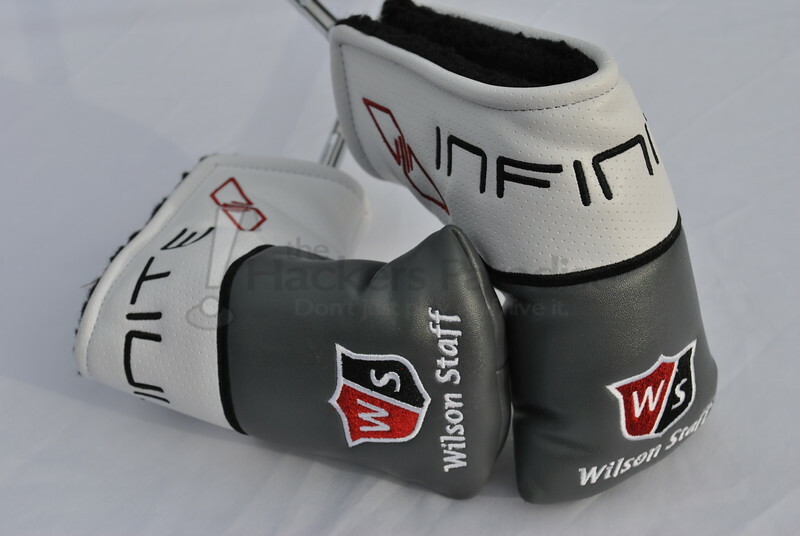 Counterbalanced technology in the Infinite putter line places additional weight in the head and in the grips. The additional weight in the grip area moves the balance point closer to the hands and creates a higher moment of inertia for the entire club, prompting a more controlled and stable putting stroke. The oversized Infinite grips, weighing 104 grams compared to the heads ranging from 355 to 365 grams, further quiet the hands and limit unwanted rotation, leading to more consistency on the greens. The deep, double milled face promotes consistent impact, roll and distance control. Six iconic head shapes – three blade (including one women’s option) and three mallet styles – were modernized with refined detailing and a premium smoke grey PVD finish. Each putter head features parallel and perpendicular sight lines, simplifying alignment for all players. Lake Shore is a rocker flange, heel-toe weighted style option with the shaft attached closer to the heel and a plumbers neck design. Grant Park is a flanged mid mallet design that is heel shafted with a short flow neck. Windy City is a modern take on a classic heel-toe weighted head style, featuring a heel shafted plumber’s neck hosel. Michigan Ave is a square heel-toe weighted blade style option with the shaft attached closer to the heel and a short slant neck design. North Side is a round, mallet style option with the shaft attached closer to the heel and a plumber’s neck design. South Side is a mallet style head that is center shafted and face balanced. 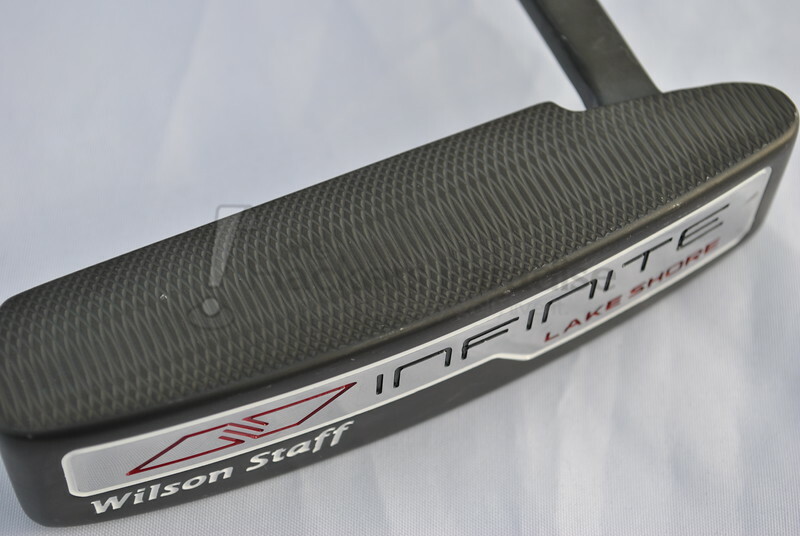 With the Infinite lineup of putters Wilson Staff has embraced their heritage, their city and their goals, and with that has created a heck of a story. The name of the line itself, “Infinite”, by definition means never-ending or extending beyond any finite value no matter how large. That can be taken two different ways – first, that the line itself at its price point is greater in value/performance than that number, and second is that their heritage will go on forever. 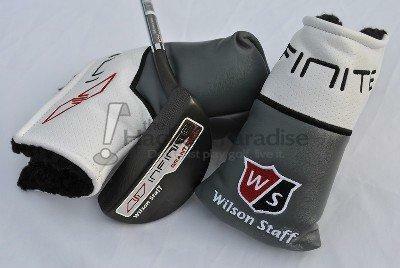 Wilson Staff also chose to embrace classic putter designs rather than trying to re-invent the wheel. It’s a simple concept that makes perfect sense – take what people know and gravitate towards in a putter design, put your touch on it, but understand that the design itself has garnered popularity (no matter how large or small) for a reason. Wilson Staff has chosen to put their touch on these six shapes aesthetically with the alignment setup and even more-so by name. Each putter in the Infinite line possesses a name that is inspired by Chicago, the city that W/S calls home. Iconic names, streets, and places from a classic American city used on iconic putter designs, it’s incredibly clever. Not to be lost in all of this is the notion of bringing a face milled classic design to market with a price point that will make it appeal to the broadest range of golfers possible. At $99.99, the Infinite lineup instantly stands out given everything they have put into the putters in terms of aesthetics and popular putter technology. While price point is always a fickle thing in the golf industry (too high and you’re viewed as crazy but too low and it’s viewed as cheap), when you can tie together a complete package and come in at a price that should be affordable for most you really have something. Add in Tour use, including a win by Padraig Harrington, and the concept and story is one of the most rounded we have seen in a while when it comes to overall putter lines. 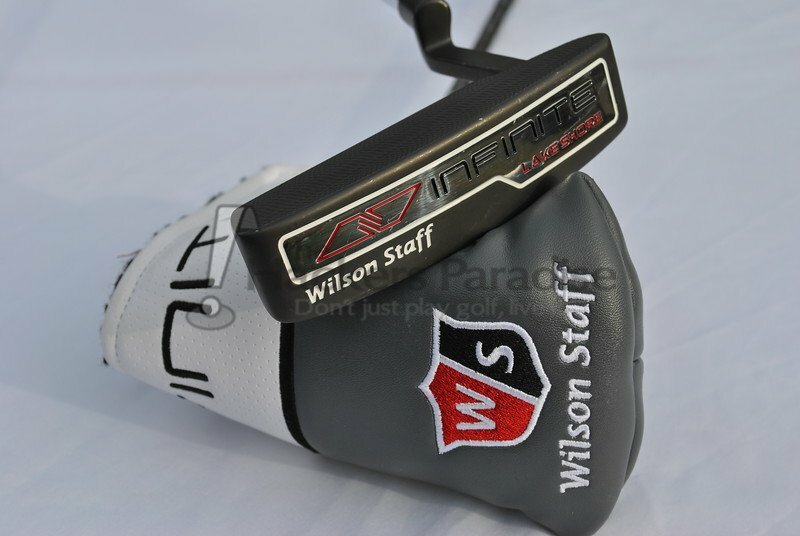 Rather than simply rolling with classic putter designs, Wilson Staff has really put in their work in improving the performance both aesthetically and in design technology. The first thing most will note is the deep grey finish, which is actually a PVD and should by all intents and purposes wear very well so long that, as with any putter, the headcover is utilized when it not in use. There is a very good mix of modern on the sole with the polished portion that adorns the Infinite name and the company’s history with the W/S crest and “Designed in Chicago, IL” in the cavity. Additionally, the alignment setup that is being utilized on each of the six headshapes certainly does. Wilson Staff has gone with a LOT of alignment lines, both parallel and perpendicular to not only aid with alignment on the intended path, but also face angle behind the ball. The perpendicular topline in fact is a throwback, which in the opinion of this reviewer, really should be utilized by more companies as it helps square the putter quite well. 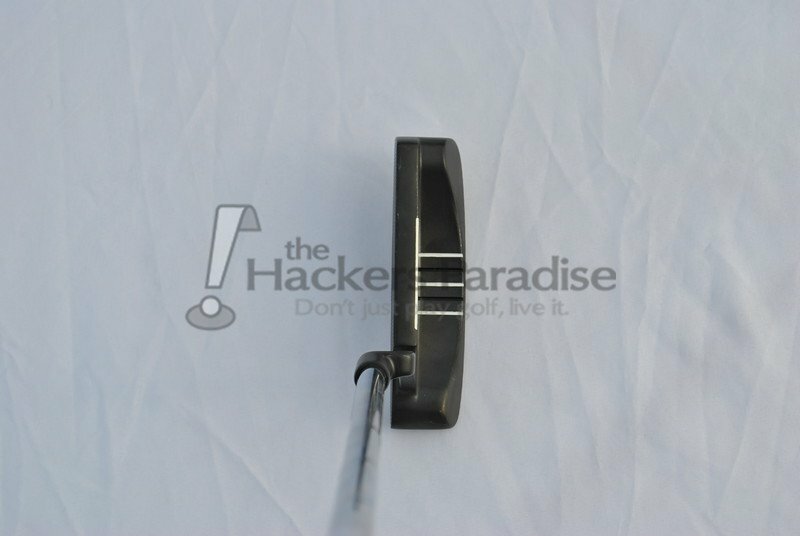 With SO MANY lines on the flange of the putters, five to be exact, the potential for being too busy is definitely there, but by utilizing black and white paintfill against the grey finish, the contrast will surprise a lot of people when the putter sits behind the ball at address. While that many lines won’t be for everyone, it is a nice and unique look that really rounds out the whole setup. Right now in putters there is no more popular trend than that of counter-balancing. Since the ban on belly putters, companies and golfers alike have realized that you can have extremely similar performance characteristics by counterbalancing a setup and moving the balance point closer to the hands rather than the head of the putter. This allows for more weight to be used in the overall design, which can really smooth out strokes for a lot of golfers. However, W/S is “bucking the trend” a bit here in that they are using head weights from 355g to 365g rather than the 385g+ we typically see in a CB setup. They are counterbalancing the head with a 104g grip that has a little more circumference to it to also help with quieting the hands. 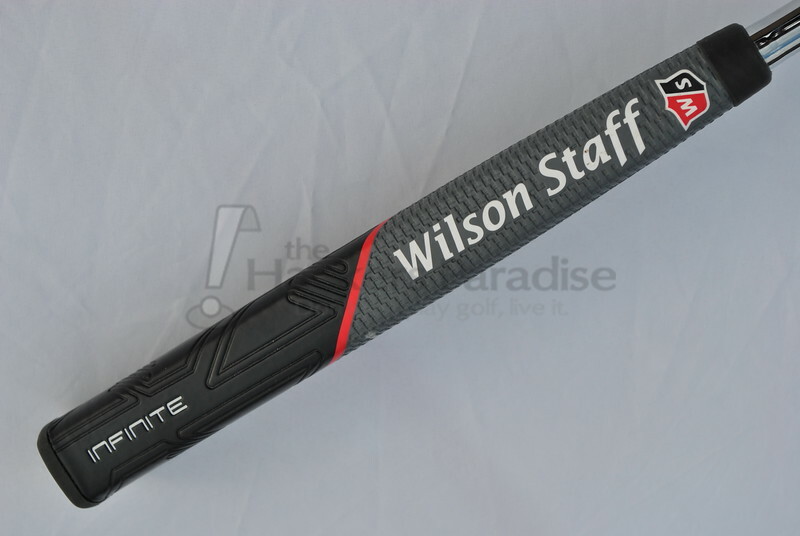 By keeping the head weight down, Wilson Staff has managed to keep the overall weight much more familiar and comfortable to the average golfer. It’s a great blend of tech and savvy here, something that will help many putt better without being too extreme. The other aspect that bears focus is the face milling on the Infinite line. While some still cling to the preference of a fully milled putter, the fact is the milling on the face is what will influence the roll and sound/feel the greatest. For W/S to face-mill the line, it accomplishes a softer “feel” (lower, less clicky sound) at impact that so many golfers seem to judge putters by and also allows them to keep the price point down compared to a fully milled design. Though some who cling to the “benefits” of fully milled designs may not like to hear it, face milling allows the user to get the best of both worlds. The nicest aspect to the way Wilson Staff went about this however is in the depth of the milling. By utilizing a deeper pattern on the face the surface areas in contact with the ball are reduced, which will help promote a better roll, but more than anything achieve that feel/sound that is so desired. Time spent with the Infinite lineup of putters really validated much of the discussion on the tech and design that has been discussed above. The putters put off a very nice lower tone at impact that has a nice “plush” connotation to it – no harshness and no clickiness. The overall balance with the CB setup is not overdone. If anything it is slightly understated when you get the putters in hand. It would be a safe venture that most who simply pick one up won’t realize that it is a CB design. Distance control and retention/reaction on misses will come back to the design being utilized, as the larger shapes will have a higher MOI by design, but it’s nice that there are so many options for one to find what fits their eye/stroke the best. While it has been the most talked about physical trait by many, the alignment line setup is an incredibly solid performance aspect as well. The white/black lines in the flanges of the various designs are right at the width of a golf ball, which is ideal for many. The outside two and middle alignment line both frame and aim the ball for the user’s intended line while the two black lines fill out the void between the other lines and simply make for a really comfortable look at setup. Add in the line on the topline that gives feedback to the face angle while blending into the five flange lines at address and the effectiveness of the overall setup in testing was without a doubt the biggest surprise. While it may scare some off, it could really calm the nerves of those who use it as it pertains to ensuring they have the proper line. The fact of the matter is that this is another perfect case of putters with tremendously nice feel and balance that would shock many if given to roll blindfolded. The key is obviously going to be getting them into hands to try. Those who get hung up on the price point as being an indicator of quality are 100% missing the boat here as the quality Infinitely overshadows the price-tag. It is evident that Wilson Staff is on a mission to reclaim the spot in the consciousness of golfers that they held for so many years in the history of golf. There is clearly a plan in place and things are being done with a purpose rather than haphazardly throwing things at a wall and hoping that they stick. The Infinite putter lineup has the ability to be everything many desire from a higher end putter in an affordable package that still has a great look and unique touch. The Infinite putter line is priced at $99.99 for each of the six models. More information on it and the rest of Wilson Staff’s offerings can be seen on their website, www.wilson.com. Nice review James. As always good info with an honest review. Well done James, and some really solid pics in the review as well. The sound that is created thanks to the deeper milling you referenced is extremely evident with this line and man does it put a solid roll on the ball. Enjoyed that review, Jman. I have played with these in stores a lot, lately, and plan to have the Northside in my bag for July. Great job covering this entire line James. More plumbers options than I personally like to see but that price point is absolutely incredible and glad to see the slant neck option. Not sure that I’m a fan of the finish as it seems to show every little scratch quite easily. Nice write-up James. I am very interested in either the Lake Shore or the Grant Park. I love the price point and face milling on these too. Very thorough review James. The quality at that pricepoint is fantastic and Wilson definitely has my attention. I think its a very attractive putter which feels great in your hands, and I am a big fan of all the extra alignment lines as well. great review with a lot of information. Great review! I really like the looks of the Lake Shore. 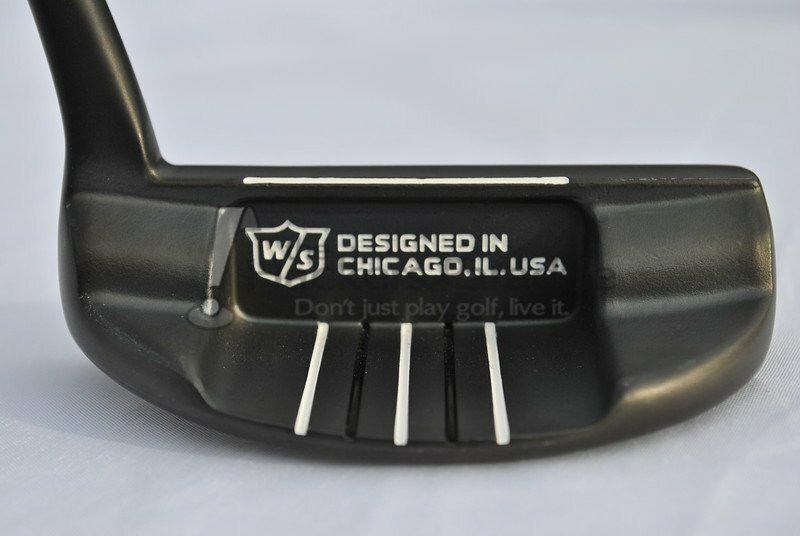 It seems to me that WS is putting out a hell of a product that they just can’t get people to try because they don’t have a lot of tour players. Great review James. W/S seems to have done their homework and are providing great value for the money. Throwback or not, the perpendicular topline alignment line is a great feature. Great stuff James. And you are spot on about the face milling. After rolling one of these for a while yesterday I picked up a milled putter and to my ear I dodmtvnotice a difference at all.